1 1/4" diameter burnt copper flower with hematite center. double sided brass leaves add movement and whimsy. chain length is 16", overall around 19". 16" sterling chain. 3/4" diameter mini sterling flower pictured with 6mm citrine in sterling bezel. various semi precious stones are available for choice. 1 1/4" sterling disk with semi precious stone, copper, brass, flanged burnt copper tube, 20 " sterling chain, 24" overall length. unique, but classic. 20" long. 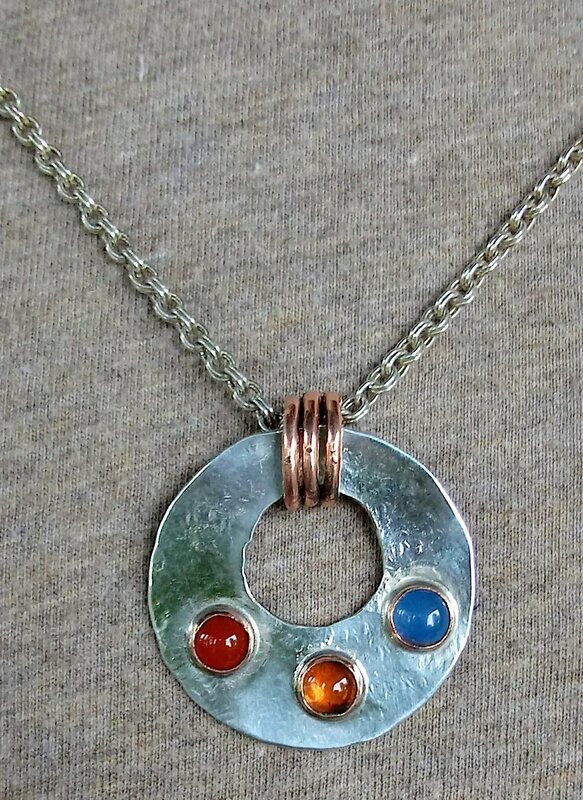 1 1/4" sterling hammered disc with copper rings, and primary colored 6mm semi precious stones. 1 1/2" sterling washer , 4 semi precious stones, marked and cut. 16" double sterling chain. large rivet washer with removable partially handmade chain-30"
2" sterling washer with large copper rivet, 3 semi precious stones, tri shape tubing. can be worn long, doubled or just as a chain. very versatile! overall pendant length is about 2 1/2". the sterling dome on top can slip up and down chain to change the look from a necklace to a vintage styleslide necklace. copper, brass, sterling, rivets, semi precious stone. length is 22" when dome rests on pendant. 1 7/8" hammered shiny copper dome, centered on doubled sterling chain surrounded by a couple copper rings and 3/4" sterling disks. the disks have semi precious stones and can slide on the chain to vary the look. 16" overall length. strong statement piece. 2 sided pendant. one side=copper, brass, sterling, semi precious stone. other side is copper with sterling dome piercing surface. sterling chain length is 18" with pendant dropping down about an additional 2 inches. 1 1/4" frosted finish sterling disk with off center hole through which 1/4" brass bar (with 5 jewel tone semi precious stones) is thread to hold neck piece in place. overall length is about 18". clean and elegant design. outer diameter is 1 1/2". 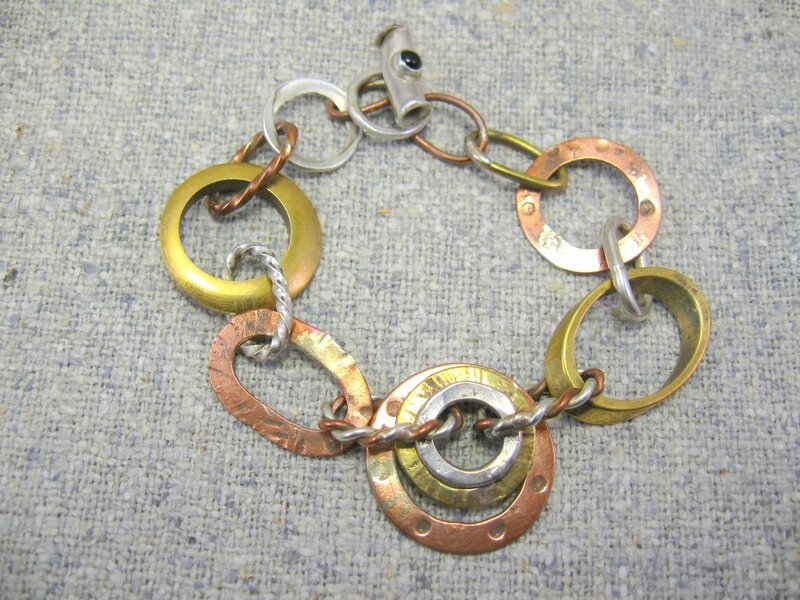 copper, brass, sterling disks loosely held in a stack on two short rods with semi precious stones set on the top. unique and technically efficient design. 18" overall length. copper, brass, and sterling. 16" length. copper, brass, and sterling. 18" long. hammered thick sterling ring, 1 1/8" diameter, on double chain adorned with copper rings. chain length is 16". simple clean yet strong design. sterling, copper, brass, semi precious stone. sterling oval measures about 2" high. 22" inch length sterling chain with additional ring to shorten to 16". pendant measures 1 1/2" X 1 1/4". Sterling, copper, brass, semi precious stone. stone varies from piece to piece. sterling chain with some handmade links included. overall length -16". copper, brass, and sterling. 3 semi precious stones. shapes each are about 1". overall length about 16". copper, brass, sterling hand formed 18" chain. copper and sterling hand formed 18" chain. mixed metal industrial feel pendant made of sterling, copper, brass with 4 semi precious stones set on 1/4" brass rectangular tubing. unusual design and looks nice when worn. 15" of sterling chain, 18" overall length. all sterling. about 20" long. 5 hammered, graduated sterling circles joined by double sterling chain. largest circle is roughly 1 1/4" diameter. copper, brass, and sterling. 1 semi precious stone, 2 riveted squares. 16" overall length. sterling, brass, copper. squares are roughly 5/8" each. 3 have semi precious stones, 2 have metal rivets. 16" overall length. each piece is unique. 3-D piece measuring 2 x 2 x 5/16". hinged top opens to reveal a marked, burnt heart within. copper, brass, sterling, semi precious stone. overall length is about 24". mini sterling heart painting necklace. solid sterling heart, roughly 7/8" diameter. 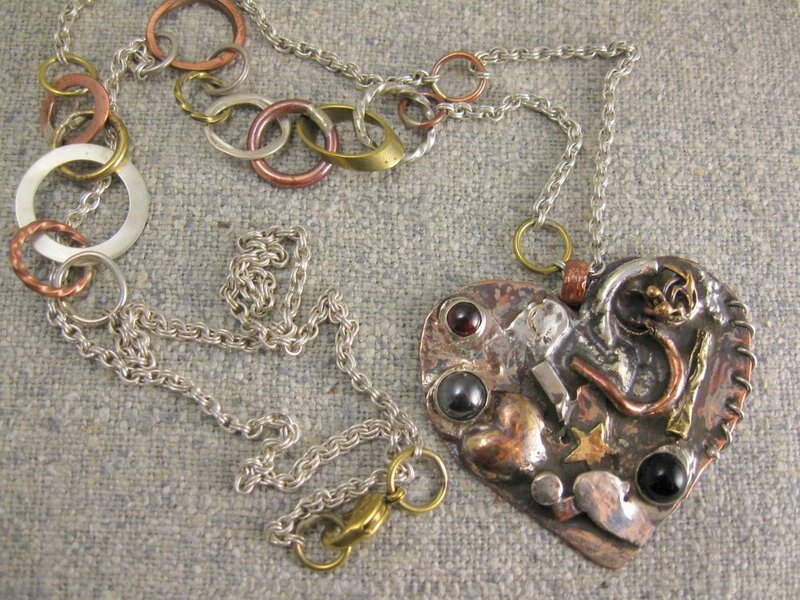 each is a one of a kind as mixed metals are fused to "paint" this art piece. number of stones vary according to what evolves. overall length is 16". 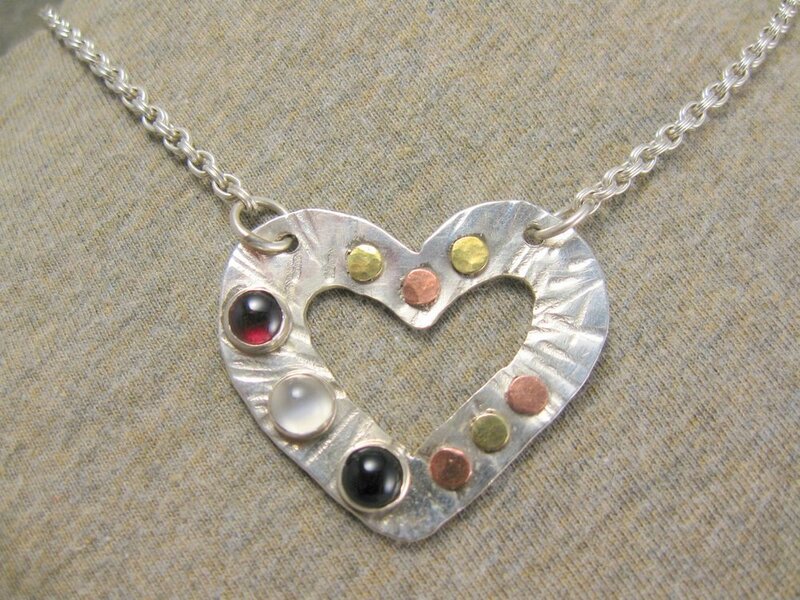 this piece looks nice layered with other necklaces or can make a nice gift for a child. each piece varies. solid sterling heart with mixed metals fused, sometimes stitched to create a unique metal painting. roughly 1 1/2" square with 2-3 semi precious stones depending on how piece evolves. sterling chain is 22" long with additional ring to shorten to 16". 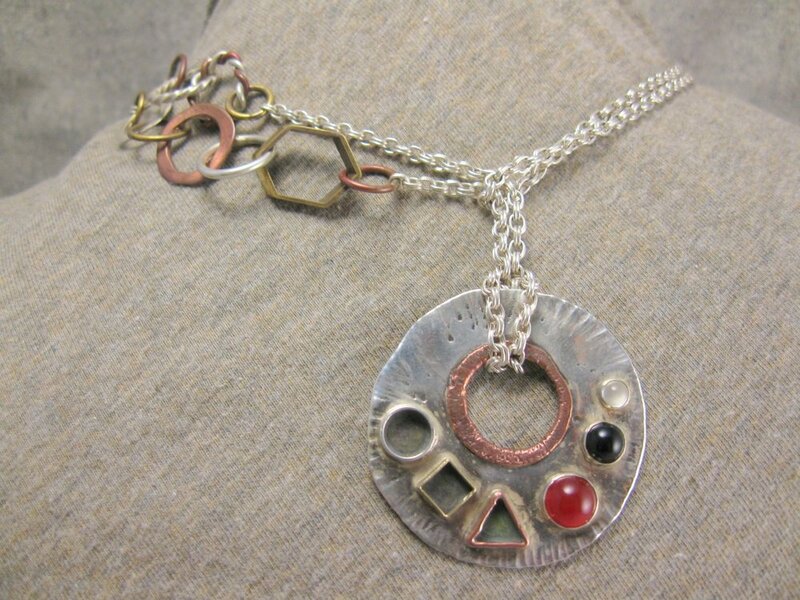 this piece looks great layered with other necklaces. one of a kind sculptural "painted" heart-about 2" x 2 1/2" - copper back plate that evolves into mini textural metal painting. each one is unique and varies in technique and number of semi precious stones. there may be charms, stitching, burning, scratching, stamping or all techniques. i never know til i am working on it. 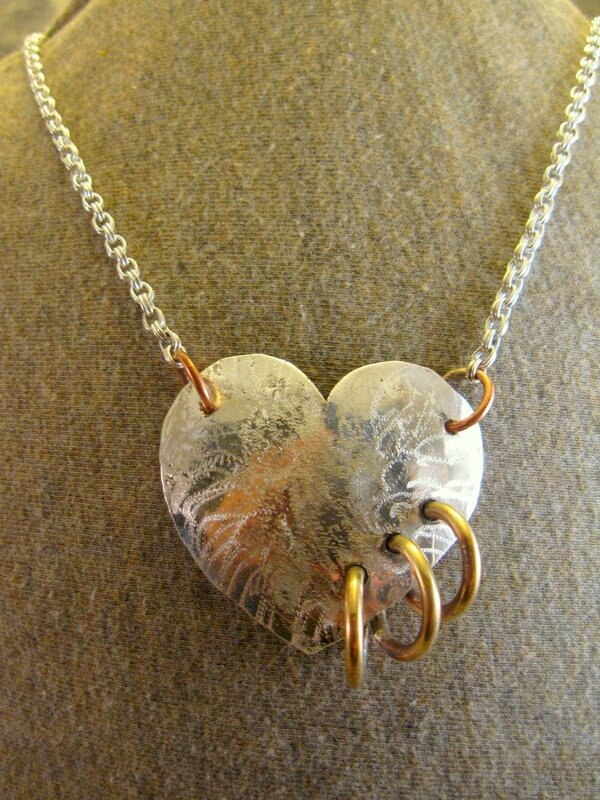 one of my favorites to make and wear-layered with other hearts! you can also double it up or lasso it or remove chain with some handmade links and just wear as a decorative chain. two sterling heart paintings, each unique, each about 1 1/2" square. solid sterling with mixed metals fused to create these unique "paintings" may have numerous semi precious stonesor not.. depending on how the pieceevolves on the bench. usually at least three stones though! 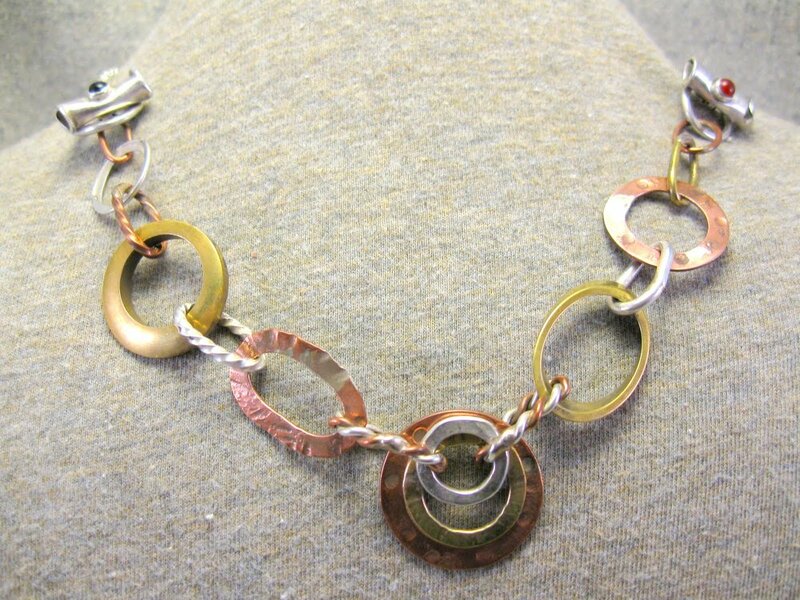 copper, brass, semi precious stones, overlapped on 22" sterling chain that has a second ring to shorten the length to 18." i wear one of these EVERY day for good luck to feel the strength of the weight- it is a solid piece. sterling, copper, brass, rivets, three semi precious stones. heart measures roughly 1 1/2" square. 16" length. sterling, copper, brass, stitches, 2 semi precious stones. 18" long. 1 5/8" square domed, etched, pierced heart. sterling, brass, copper, sterling chain. 16"-18" overall length. every piece varies. 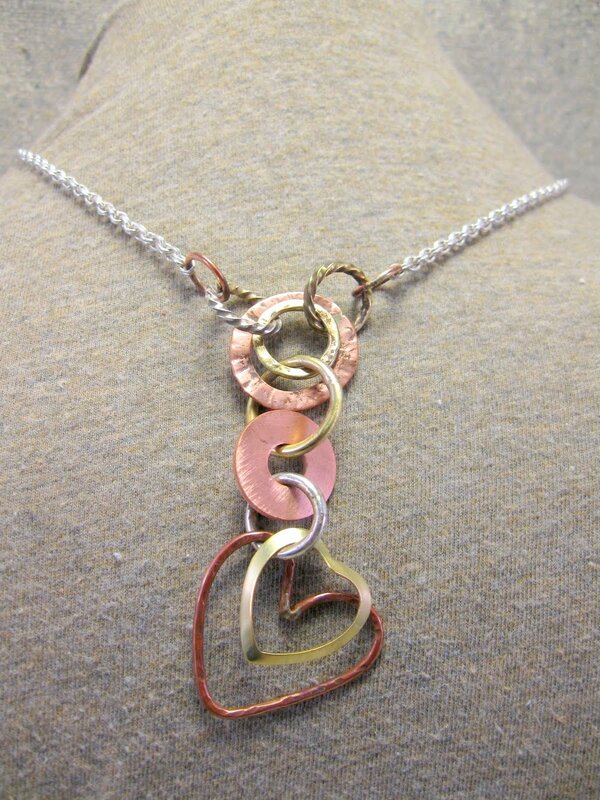 sterling, copper, brass, always 2 hearts,with 18" sterling chain. overall piece with drop is about 22" in length. 28" overall. 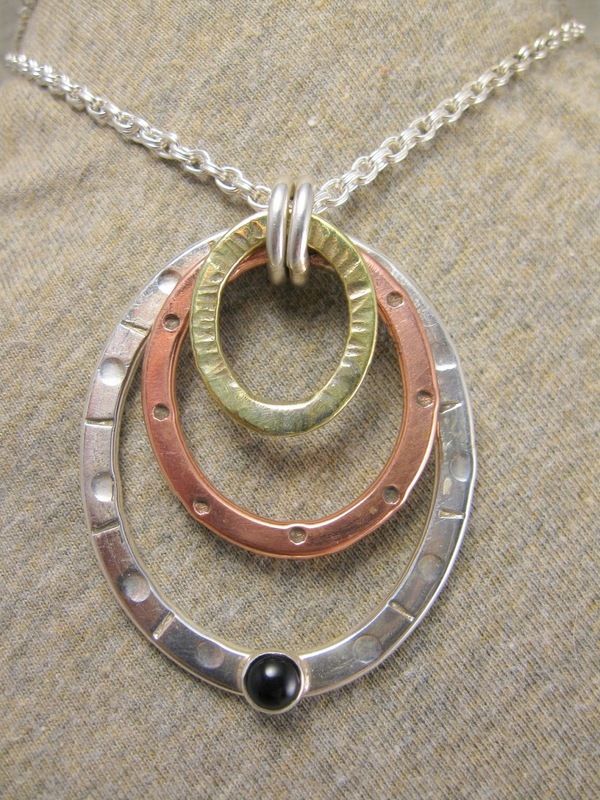 sterling chain punctuated with mixed metal jump rings, washers, tubing with bottom accent of flanged copper tube with three sterling rings through which chain threads and holds another copper washer. this accent drop can also hang in the back and would look fabulous on a dress with a v-back. can be worn as playful necklet or wrap roughly 3 x around wrist as bracelet. all decorative pieces are double sided- stars and stones on both sides. 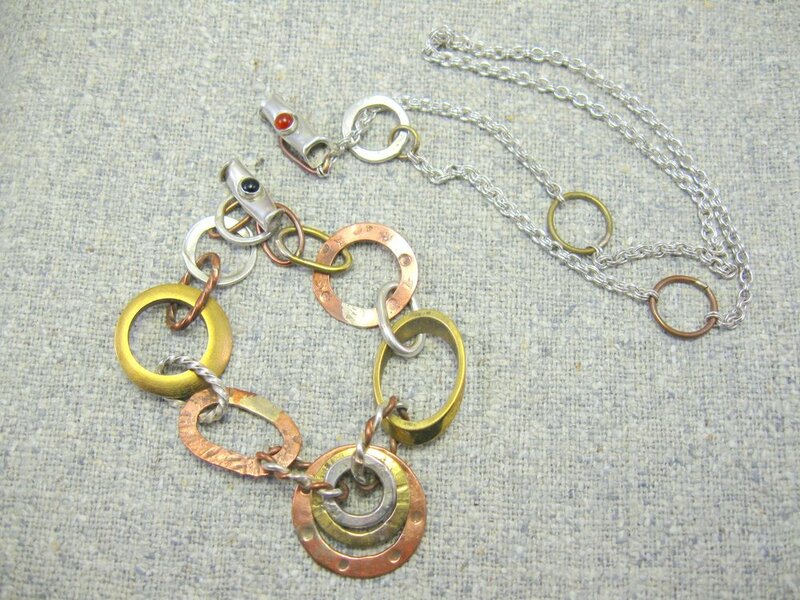 copper, brass, sterling with semi precious stones and sterling chain. overall length is 23". fun piece. sterlingchain with mixed metal rings holding two solid sterling hammered bars with black onyx stones leading to a 1" copper handmade washer. 18" overall. copper, brass, and sterling. 1" center disk. 18" overall length. 8 sterling bars (7/8" long). 8 assorted semi precious stones. brass rings. 18" overall length yet is adjustable and designed to fall at base of neck to sit flat and not flip. nice necklace. designed with front side toggle with stone clasp, double sterling chain with 5 varied decorated or hammered mixed metal domes-2 copper, 2 brass, 1 sterling between 5/8"-1". domes can be moved around chain to be worn as you wish, changing look. 18" overall length with 2nd ring to shorten to 16" if desired. fun piece to wear. sterling, copper, brass, 3 semi precious stones. 16" sterling flex cable. 18" length to fall below collarbone. elliptically shaped, hammered heavy sterling wire (3-4") with dangling copper and one sterling ring. off center onyx set in copper bezel. sterling chain. sterling, copper, brass. 2 (3/4") sterling bars with black onyx stones. this looks great with a v-neck shirt. overall length is about 20". copper, sterling, semi precious stone. pendant size is about 1 5/8" x1 3/8". 16" length. three possibilities from one necklace! option one: 24" partially hand made chain , toggles, sterling chain. option two: 17" sterling chain with decorative sterling front toggle closure as seen in next image. option three: 7-8" hand made mixed metal chain bracelet with toggle clasp. the toggles on this piece have semi precious stones on them. fun piece. option two. 17". sterling chain, toggle, semi precious stone. option three- mixed metal chain bracelet and also front part of chain when worn long! 7+". graduated.brass, copper, and sterling ovals. sterling oval is 5/8" x 1 1/8". 6 semi precious stones. approx 18-20" long. looks great worn with a V-neck. 3 hammered 1/2" sterling disks with semi precious stones in copper bezels. disks are reversible with different stones on all six sides. connected by brass tubes and copper rings. approx 17". 1/2" x 3" hammered sterling bar with 5 different jewel color semi precious stones set in copper bezels. approx 16".